The new office location will provide personalized and local legal services for the firm's Kissimmee clients and surrounding areas. "Our new permanent home located directly behind the Osceola County courthouse will cement our position as the law firm to call when Kissimmee residents need a lawyer," said attorney Walter Benenati. ORLANDO, FL, July 25, 2018 /24-7PressRelease/ -- Attorney Walter Benenati of The Benenati Law Firm is pleased to announce the relocation and opening of his firm's new office in Kissimmee. The office is located at 624 Patrick Street, Kissimmee, FL 34741. "Our new permanent home located directly behind the Osceola County courthouse will cement our position as the law firm to call when Kissimmee residents need a lawyer," said attorney Walter Benenati. "Kissimmee is a vibrant community that is on the rise. It is experiencing a cultural and economic renaissance. We want to continue to be a part of it as we have done so for the last ten years." The new office location is a standalone building with easily accessible parking that will provide personalized and local legal services for the firm's Kissimmee clients and surrounding areas, including: St. Cloud, Davenport, Poinciana, Palm Bay and Haines City. 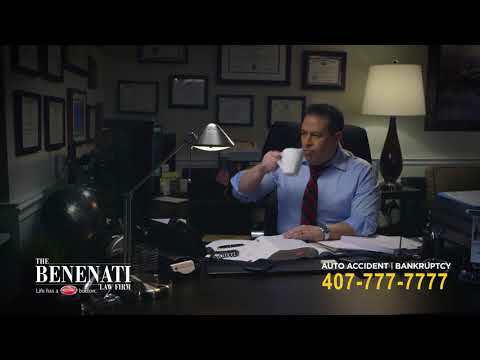 For more than a decade, The Benenati Law Firm has represented over twelve thousand people from their Orlando and Kissimmee offices. The firm's culture of care makes clients feel comfortable and confident about their legal representation. The Firm's mission has always been to provide exceptional legal services at an affordable rate for Central Florida residents. The Benenati Law Firm has recovered millions of dollars for their personal injury clients and eliminated nearly a billion dollars of debt for their bankruptcy clients making them one of the top twenty filers of bankruptcy in the nation.